I am so happy they value RW that much that thry let him threw the ball on the one yard line. Would I take Wilson once Brady’s gone? Hell yes. In a heartbeat. They better hit on the draft, they have just a few picks, that's a trade partner right there, Bill and Pete are buddies. It’s a non-political story. What’s the problem. What’s the problem? I could have gone more down market and linked to the NYT or Washington Post. It’s a non-political story. Big deal. I do not get the connection with Russell Wilson's reported contract and a billionaires gift to rebuild Notre Dame??? Hi Darryl. Hope you’re well. With the experience he has he would have been easily better than Mahomes last year with the easy mode offense KC had. I think he’s a good overall quarterback despite his flaws, but I think top 5 is laughable, and someone saying best QB in league behind only Brady beyond laughable. The guy is obviously athletic and a very capable starter. He’s also far, far away from the superstar territory where many, if not most, put him. I don’t know how Wilson would have fared with KC. I’m sure he would have done just fine, but he isn’t capable of quick decisions in the pocket and then throwing pinpoint lasers all game, which is what Mahomes did for a long time until he started trying to scramble and make Rodgers-Wilson plays as the season waned down and he seemed to embrace difficult plays much like those two. I get your point and definitely agree that top 5 is a crazy projection without more evidence. I think he would look more decisive and more competent if he had a OC that could make things easy for him like Reid does for Mahomes and, of course, the set of players KC had to support him on offense. But would you take Wilson as your QB though? Yes or no? Clearly not everyone shares your negative opinion of Breitbart. Your political perspective is evidently in play here and this forum is certainly not the place for that. Thanks to defamegate I won't be a fan of the NYFL once Brady is gone so I won't have to deal with that. 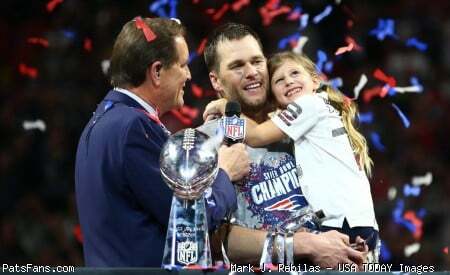 If Brady (and I) can last two more years that'll give me 60 years as a Pats fan. I think you don't watch enough Seahawks games. Wilson has played behind awful OLs most of his career, and with mediocre receivers (as the team spent money on D only). He's also been incredibly consistent, with nearly 4,000 yards/year and a QB rating of just under 100 over seven years. Incredibly consistent...8-3 in the playoffs (more than 7 franchises), one amazing play from 9-2 and two rings. He has a higher winning % than Rodgers. He's missed the playoffs ONCE in 7 years. I'd take him over any QB in the league not named Brady for the next few years. Mahomes landed in the sweetest position in the NFL last year, with a great receiving TE, a fantastic all-purpose back, and the most explosive WR in the league, a great OL and a head coach who knows how to run an offense. Like Dak Prescott, the guy spent his first year in the spotlight with a clean pocket. Let's see him going forward before the beatification, okay? So go ahead, name me all these superstar, more deserving QBs. One more thing to appreciate Brady about. We not only hit the lottery because he's the GOAT skillwise, was a major draft steal, but because he's a freak of nature willing to repeatedly sign a lesser $ market deal.